RRB60-006N -- 60th (Royal American), Regiment of Foot, 4 Line Infantry at Attention. The 60th (Royal American) Regiment of Foot, better known under its later name, The King's Royal Rifle Corps, has long been associated with Canada. 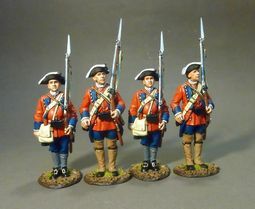 After Braddock's defeat by the French and Indians in 1755, authority was granted to raise a regiment of four battalions to be recruited in Germany and from German colonists in North America. 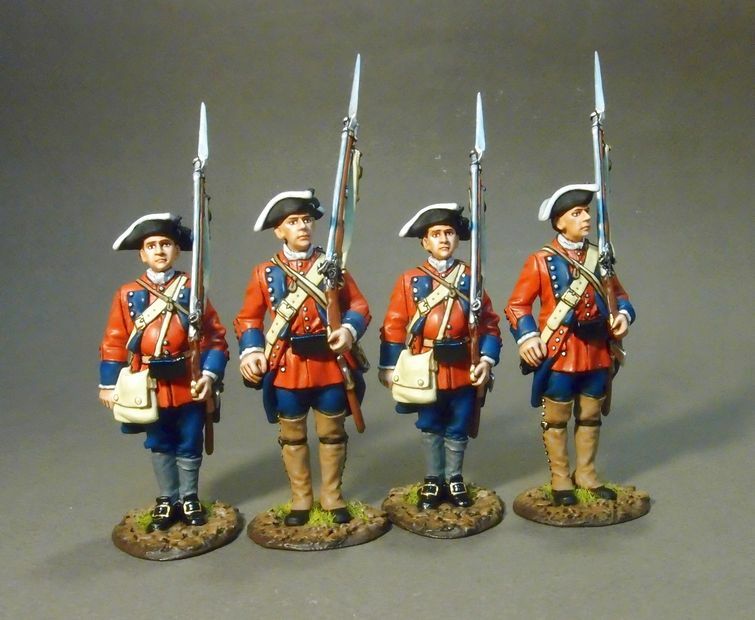 The regiment was named the 62nd, or Royal American, Regiment of Foot; but it was re-designated the 60th (Royal American) Regiment of Foot in February 1757. Recruiting for the Royal Americans in North America was disappointing, and more than half its strength was drafted from men rejected by British regiments in Ireland. From this unlikely collection of foreigners and cast-offs was fashioned one of the most renowned corps of the British Army.